So.. yep.. It happened.. It's officially my last week in the MTC!! So surreal. This time next week I'll be in Albania. How freaking crazy is that?! I'm so excited.. A little nervous.. Or more than a little nervous, but so excited. I also made it through consecration week.. So go me. Firstly, mom & dad! Here's some info for ya. I leave SLC at 10:00 on Tuesday morning (April 1st).. which by the way means I have to meet at the travel office at 4:35 AM.. It's basically a sick joke. But whatever, I'm just so excited that even waking up at that ridiculous hour is worth it. From SLC I fly to Chicago. So, I'm supposed to land in Chicago at around 2:15 PM. I have like a 2 hour layover there, and that's where I will most likely call you from. SO, do me a solid and send me a DearElder letting me know whether or not I should call your cell phone or if I have to call Caitlin instead or what not. I leave Chicago at 4:05 PM and then head on over to Vienna, Austria.. and we land there at 8:40 AM.. the following day. Might I remind you that I'm making this awfully long trip with a group of 14 elders. Oh my goodness.. I'm sure I'll have some absolutely ridiculous stories for you. Haha, give me so much strength. So, I'll tell ya a cool story from this past week. 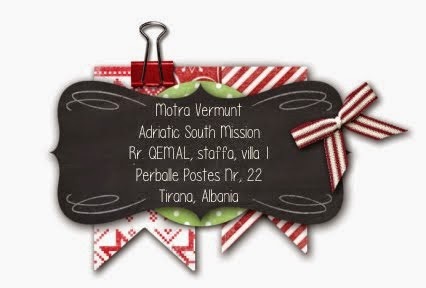 So, on Thursday nights we do TRC.. and that's where volunteers who have served in Albania (there's also a girl that does it that's actually from Albania too) come in and let us teach them. It's pretty fun cause a lot of the volunteers know Kent and Joel. But, anyway this past week was our first week teaching a 40 minute lesson as opposed to two 20 minute lessons. And my teaching companion Elder Watson and I had prepared a lesson about receiving revelation through prayer. So, we're in there and stuff and I start the lesson and I say that we want to talk about revelation.. through the Book of Mormon. But, what was interesting about this.. Is that it wasn't until over halfway through the lesson that I was like.. oh my gosh.. oh my gosh.. We're teaching the wrong lesson. It's supposed to be on prayer! What!! I was freaking out, I was like.. I am the dumbest person ever. But, the volunteers were super involved and we were sharing so many scriptures and experiences and stuff. It was a really good lesson. But, when we got out I was basically like crying and I was like "Elder Watson, I'm so sorry!! I'm so sorry, I'm so dumb! Why didn't you stop and correct me when I said 'revelation through the Book of Mormon'?" Elder Watson being the kind person that he is was like, because I figured that the Spirit was guiding you to say that. At first it was really difficult for me to think that the Spirit guided me to teach the wrong lesson and I felt so upset about it. I prayed to Heavenly Father to understand if I was actually being guided, and I found this scripture in Mark 13. Verse 11 reads, ".. Take no thought beforehand what ye shall speak... but whatsoever shall be given you in that hour, that speak ye: for it is not ye that speak, but the Holy Ghost." How cool is that? Elder Watson and I are just two missionaries that know very little Albanian. And yet, we were able to teach a 40 minute lesson that we were completely unprepared for. That's not a coincidence. That's not easy. We were thinking of and finding scriptures in Albanian. It was so cool, and it was something that I needed to understand so bad. The Spirit is the teacher. I'm not. Seriously guys, the gospel is so cool. So, one of my goals for my mission are that I want to be able to look back as I get on the plane to come home and know that there was NOTHING else I could have done. That I did everything that I could have possibly done for the Albanian people and I worked my hardest everyday. As I've been in the MTC that has also been one of my goals. To be honest, it's hard because when you're in a classroom for like 10 hours a day it's hard to remain focused and there have definitely been times where I've not been as dedicated or focused as I ought to be. Especially because some of my elders are so dang funny. But, this Sunday I had my final interview with my branch president and he honestly boosted my confidence so much. 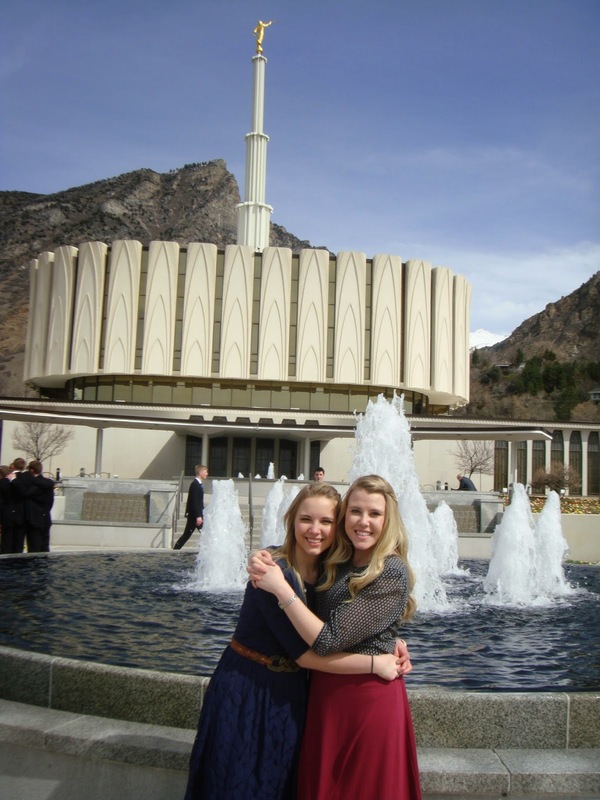 He told me that he KNOWS that the MTC is a better place simply from me having been here. He told me that many missionaries in their weekly letters told him of how I had helped them or provided answers to their prayers. I cannot tell you how humbling it is to hear that you're making a difference when you're not even aware of it. I wish I could take the credit, but honestly.. It's not me at all. I just say whatever the Lord places in my mind. I feel so incredibly blessed that He feels that He can trust me to help His children here in the MTC. I'm getting really sad to think about leaving all the people that I serve with right now :( But, I'm SO excited to have a female companion. Haha, it's gonna be so refreshing! AH! I'm so excited. I cannot even articulate to you all how much I already love the Albanian people. Amanda taught an Albanian family in Georgia and I found myself like being emotionally connected to what happened with them because I truly just am so excited to help them! This is the new Hungarian siter. She is from Hill Spring, AB! I love you all, I hope all is going well. By the way, Steph!! Congratulations for being the best thing to happen to Bert Church basketball since like.. Kari Gallup. That's awesome that they retired your jersey. You're a legend. Maybe they can frame the section of wall that I broke my hand on in that hallway.. Just to make it fair, ya know? Haha, but really. You're awesome. I hope everything is going well for everyone at home. I am so grateful for this opportunity to serve the Lord, I promise you that this Church is true and that the gospel of Jesus Christ IS the way to find true happiness. In 9 weeks I have come to understand without a shadow of a doubt that Heavenly Father has a perfect knowledge of all of His children. No matter where they are or what they're doing. There is never a time where we fall under the radar and cannot receive His love. No big deal, the next time you get an e-mail from me.. I'll be in Europe. Wish me luck! 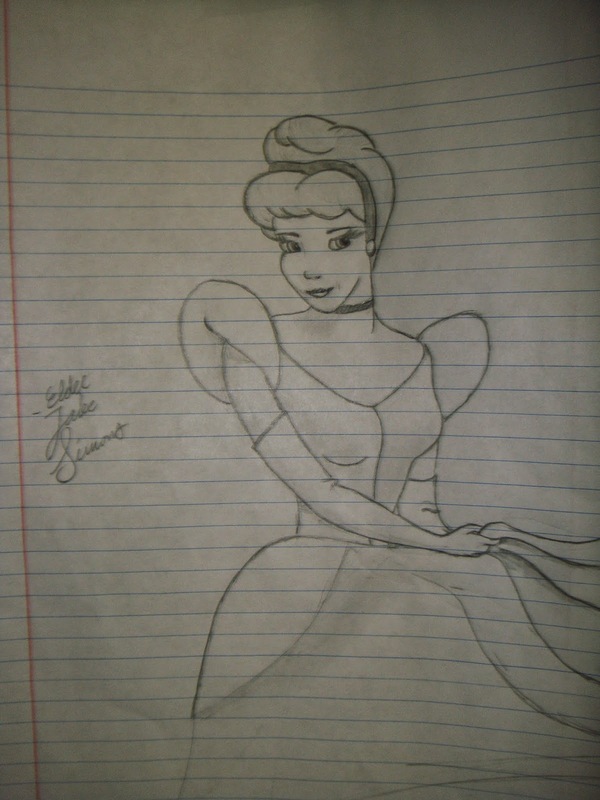 Elder Simons drew me this, I am still obsessed with Cinderella. Sister Bates & I. I freaking LOVE this girl! How are y'all doing? I hope everything is good up in the Great White North! So sad to hear about baby Lolee and Georgia. What the heck Wood's?! Talk about taking care of free health care. Haha, that's so sad. & I LOVE LENI. What even, why does our family have such cute kids. It's hard to live up to these standards.. Talk about leaving me with big shoes to fill. Speaking of! Okay, so mom and dad.. I'll get my flight plans on this Friday for when I'm gonna be leaving/which airports and what not, so I'll have that information for you by next Wednesday. I leave for Albania on April 1st, which means that I'm now in what we call "consecration week". So, basically I speak my mission language all the time. I'm really excited.. But really nervous at the same time, I'm afraid that this week will just make me realize that I'm incompetent. Haha, but so far so good. The language is coming along decent, it's not perfect by any means.. But it's coming. I've also thought of some other ways that I can truly consecrate myself to the work and show the Lord that my mind and my heart are truly dedicated to His work. I think some great things will come of it. I'm so excited to get to Albania, honestly.. I am so excited to stop talking about the culture and the people and actually experience it and meet the people myself! I'm also really excited to teach with another Motra. That will be cool. I am now in a room with Sister Sedgwick, Sister Bates and Sister Johnston, since Sister Feil left on Monday, I had to move all of my stuff into their room and I'm now technically a part of that companionship for the next 2 weeks. 2 WEEKS, Oh my goodness. I seriously have to pinch myself like all the time when I think about that. Ah, so crazy. Sadly, this week I was released from being a Sister Training Leader and Sister Bates and Sister Johnston were called because I'm leaving. But, apparently when President Hutchings interviewed them, he told them that Sister Feil and I were the best Sister Training Leaders he's ever worked with! I'm so grateful! That's so nice of him to say! I'm sad that I don't get to be apart of the branch counsel meetings anymore. Those were great. I'm seriously so happy here, it's really hard. The language can be discouraging, and sometimes time just doesn't pass the way that it should. But at the same time, I've never felt so much love for other people and I've never felt so close to my Heavenly Father. I literally receive constant direction and guidance from Him and I can't explain how special that is. In this past week, I have been told on multiple occasions, "you just answered my prayer!" and I promise you that it is not me, it is the Lord simply speaking through me, just as He does through others. He will do whatever He needs to in order to provide His children with the help that they need. I promise you that. It is so exciting to be able to watch these things happen. It's amazing. Honestly! Thank you all again for all of your love and support, I hope that everything is well at home and that it's starting to warm up! Hello family! I have so much to tell you so this week! This week has gone by SO fast, I can't believe it's P-day again. Oh my goodness. Not that I'm complaining.. This past week without a doubt has been the most spiritual week of my entire life. I'm seriously so blessed and so grateful and SO in love with the gospel, I cannot even express it to you. 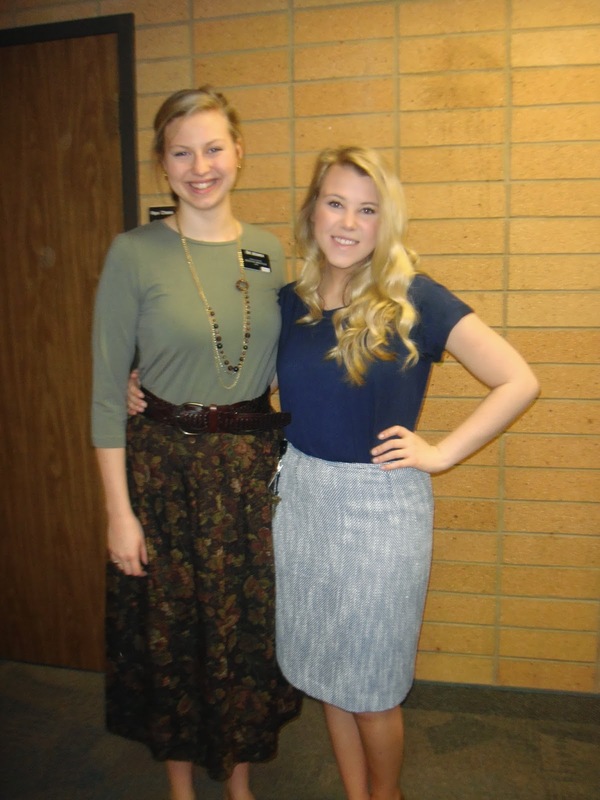 "You are a great example of a great missionary, not only for the sisters but for the elders and your leaders as well. SO THANK YOU!!!. Second, for the first time I received a note from the instructors who said "Nothing that I can think of" as it relates to the teachers plan for improvement with the missionary. They always have something they are trying to do to help improve the missionary. What a great compliment to you. I congrats you on doing an outstanding job and encourage you to keep up on the path you are taking." I was seriously SO excited! That's the nicest thing that could have been said, I know I have TONS to work on but it's kind of cool that my teachers don't see my faults as easily as I do. I'm so grateful for that. It snowed this week, and we were all like.. Is this some kind of a sick joke. Are we in Canada right now?! Spring is supposed to be here. My next story is one of the many miracles that I saw this past week. Last fast Sunday, President Hutchings told us that "if the Holy Ghost tells you to bear your testimony, never make him tell you twice." So, I was sitting there.. and the Holy Ghost told me to talk about how God loves His children. But, I didn't really want to do it.. So, I didn't get up. And the Holy Ghost told me again.. and then I decided that I better not make him tell me a third time. So, I got up and I bore my testimony.. and I found myself promising our branch that if they prayed to Heavenly Father asking Him if He really knew them, He would manifest it to them.. Do I have the power to promise that.. I don't even know. Anyway, I didn't really understand who needed to hear that or why I needed to say it, but I just did. But this past week, one of the sisters in the branch, little Sisar Bates was having a little bit of a rough week, and she was just really down and frustrated. One morning we were sitting at breakfast and I noticed that she seemed a little off.. so, I pulled her aside and asked her if she was okay.. And she was just like, "I am so scared.. I woke up and I can't really see out of my left eye.. Everything is blurry and all out of shape and its like I'm wearing someone else contacts or something but I'm not!" and I could seriously tell she was so scared and her companions were gonna go and take her to medical. But she was like, I feel like I need a blessing.. So, I asked her who she felt comfortable with and she mentioned one of the Hungarian elders. So, after breakfast Sisar Bates, Sister Johnston, Sister Sedgwick and 3 Hungarian elders went into a room so that she could get a blessing. She was seriously so scared, I felt so bad for her. But, Elder Haws started the blessing and seriously guys.. It was the most tender, heartfelt blessing ever. 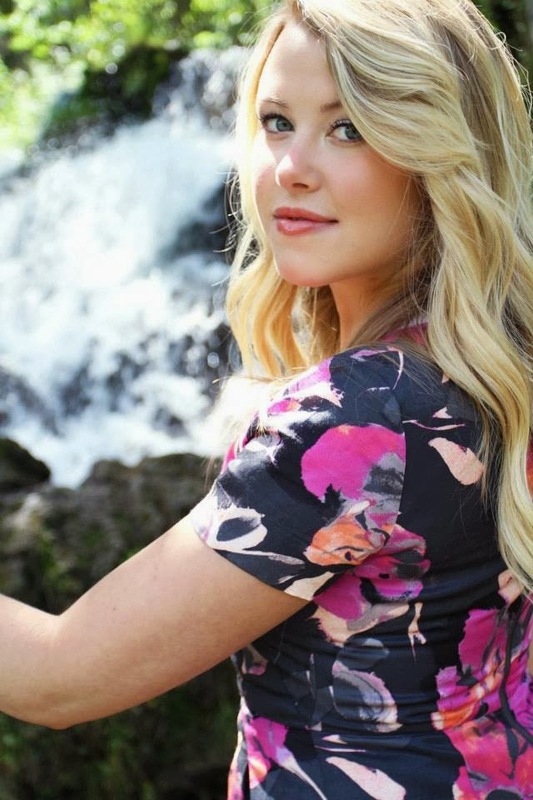 But, it was kind of strange because Elder Haws didn't say anything about her eye.. Instead he just continually talked about how much God loves Sisar Bates and how aware of her He is, and how proud of her He is for the way she is serving.. It was really cool and so sweet. The Spirit was SO SO strong, honestly. It was tangible. You could literally feel it. Elder Haws finished the blessing, and Sisar Bates wipes her eyes from the tears and she just starts SOBBING, and she's like.. "I can see!!" And as she said that, I promise you all, I promise you.. There were angels in that room. We were all just like, we just witnessed someone be healed. Like, what! We all just stood in silence and in like wonder of how powerful it was. It was incredible. Then, all 7 of us missionaries knelt down together and Sisar Bates prayed and thanked Heavenly Father for the blessing and for the Spirit that we felt. It was incredible. After, I went straight back to the classroom and recorded everything I felt in my journal because I have never felt the Spirit so incredibly strong. I saw Sisar Bates later and she said that "Motra, you know this is all because of you right?" I was like.. um, what? And she told me that she was so frustrated and she remembered the promise that I gave to everyone in my testimony and she knelt down and she pleaded to know if the Lord knew who she was. The blessing that Elder Haws gave was an answer to that prayer. He said nothing about her eye because that was not what Heavenly Father needed her to know. She just needed to have something happen to her physically to take her to the point of feeling like she needed a priesthood blessing. How poetic and amazing is that? Heavenly Father took away her physical sight so that she could gain spiritual sight and see how much He cares for her as His daughter. I was seriously SO happy that the Lord felt that He could speak through me to reach His other children that were struggling. Seriously, amazing. Good news y'all.. the Church is true. In this last week, I have experienced the power of God time and time again and I have NEVER been so happy. I wish that you all could witness and hear my voice when I speak about what I now KNOW. I have never been more sure about anything in my life. I am so grateful that I am here! I love my mission so much. And get this.. I leave in like less than 3 weeks now. WHAT. Oh my goodness, I cannot wait to get out there and attempt (emphasis on attempt) to deliver my testimony to those people in Albania. I know that this gospel changes lives. So, if it's alright.. just as I did in Sacrament meeting this last month.. I would like to invite anyone who feels that they have fallen under the radar, that Heavenly Father isn't aware of them or doesn't know them specifically.. PLEASE, pray! Ask Him, just be like, Heavenly Father do you even know me? Do you know who I am? What I'm doing? He will answer you. In His own way and in His own time, He will make you very much aware. I have seen Him do it. I have received an answer myself. I promise it is true. I love you all, I hope all is well at home. I miss you all, but to be honest I don't think about home very much at all. I'm so happy where I am and so happy with what I'm doing. So, I got SO much mail this past week and I'm so grateful.. But, it means that I'm like extra low on time today. So this e-mail might be a little bit shorter. Sorry, I love you all. Firstly, Mom I got both packages thank you SO much I was so excited. The clothes were such a nice surprise. It was awesome, I love you. Thank you. Um, what the heck.. My parents are like world travelers.. Dad e-mails me from Turkey, Mom from London.. That's crazy. I LOVE Leni. So so so so so cute. Tell Mackenzie she's adorable and I expect so many more pictures. I'm so sorry that it's so cold in Canada that's crazy. It's so nice and warm here is glorious. But it makes it so hard to be in a classroom all day. Seriously. Okay, so the language is getting slightly easier.. I think. I don't know. I really want to be like perfect right now and that's not gonna happen. But, I'm dying. I just want to be able to express myself like I can in English. But, it's coming slowly but surely. Patience is not a fun thing to develop. But, I'm doing so much more than I would be able to without the Lord's help. I'm serious. This week seems to be have gone by so fast, I can't even think about what has happened. It's crazy! My companion leaves in 2 weeks and then I leave 2 weeks after that. That is so freaking fast! Oh my goodness. I seriously LOVE all of the missionaries here. I'm so grateful for them. Although sometimes I am just overwhelmed by the testosterone that surrounds me, they are like the 14 greatest Elders ever. I die laughing all the time. The funniest one is Elder Simons, his facial expressions are hysterical. I'm always struggling not to laugh at him. Elder Myers is still my top dude. He's so fun and chill and I'd probably not survive if it were not for him. Elder's Bangerter and Watson are the most dedicated and talented missionaries. They have the greatest work ethic and are so obedient. They're great examples. Elder Smoot has the craziest memory. He has like photographic memory and remembers scriptures so well. I wanna have that. Elder Temple is rad like I've said. Elder Waters is from New Zealand and I could just listen to him talk forever because his accent is so cool. And.. ya. This week, my love for the scriptures has grown so much. Honestly, how amazing is it that a book written centuries ago can apply perfectly to what we are going through today. Honestly, answers to any questions can be found in the scriptures. I love them so much. We get an hour of personal study each day and I'm like so sad when that's over because I have been learning so much about the gospel. I love this gospel so much, at the end of each day I just sit and marvel at the things that I am learning and how hard life would be if I didn't have the understanding that I do. That's why I'm so excited to go to Albania, to give people the comfort and peace that I have. We are all so blessed! I have such great faith in the scriptures and in their power to help you in anyway you need. The words are for US. Last night in devotional, we had a great member of the seventy come and talk to us. My favourite part of his address was when he said that the Lord sent us here for right NOW. So cool. Alright, I love you all. Keep it real. Oh and by the way, I'll try and write more next week but..
Duke mësuar një gjuhen është shumë i vështirë, por më marr lumturi e madhë. Ju më mungoni!